Shortly after arriving at Debdale Wharf today, our boat emerged from the grit blasting shed with the hull looking all shiney and new. After some final checks to ensure all the work was complete, and that the gas regulator had been reinstalled safely we were relaunched. By the time we had loaded all our stuff from the car it was midday, so we cruised as far as Foxton and stopped for lunch. Checking in with the lock keeper we were fifth in the queue to go up. The ascent was uneventful, but initially I could not understand why there were so many families about. Then it dawned, it was half term week. The crew however, were grateful for the extra assistance in opening and closing the gates. Needless to say, we now have a few scuffs on our newly painted hull, fortunately they are confined to the rubbing strake and that's what it's there for. Once up the flight of ten locks we set off for Welford Junction, approx three hours away. By the time we were approaching Husband Bosworth tunnel, the light was starting to fade. Emerging 20 minutes later, we had to leave all our navigation lights on for the remainder of the journey, as it was now quite dark. At the junction we turned right and found the mooring virtually vacant. We moored on the rings in the dark, at least I could not see our newly acquired scratches. Tomorrow rain is forecast in the morning clearing by lunchtime. If this proves correct, we will set off for Yelvertoft late morning. Today's visit to the boatyard revealed an almost finished boat. The final coating was applied late on Friday, which has given it the whole weekend to harden. All that remains is for the red and cream tunnel bands to be painted on the stern, for the weed hatch to be refitted and the anodes welded back on. We are anticipating a relaunch on Tuesday morning. Assuming all goes to plan tomorrow, we should be ascending Foxton Locks by midday. An hour later, I suspect we will have some fresh war wounds to our newly painted hull. Yesterday we took a trip to the market town of Oundle in Northamptonshire. We walked around Barnwell Country Park which runs adjacent to the River Nene, and had our first look at the guillotine type locks found on this river familiarising ourselves with the method of operation. Today it was back to Debdale Wharf. 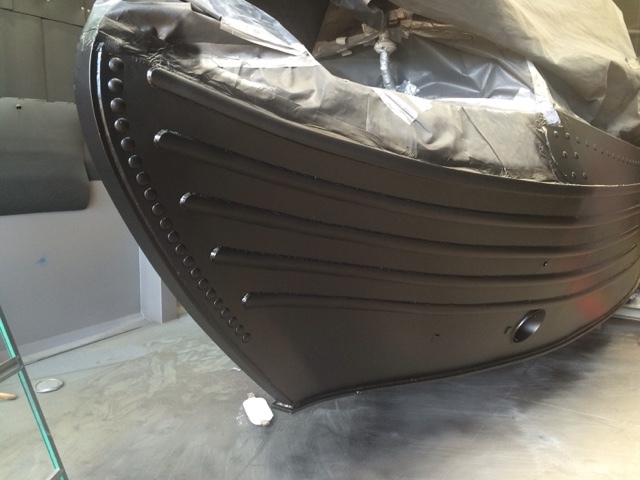 We saw the boat sides had been fully grit blasted and the hot zinc spray coating had been applied. 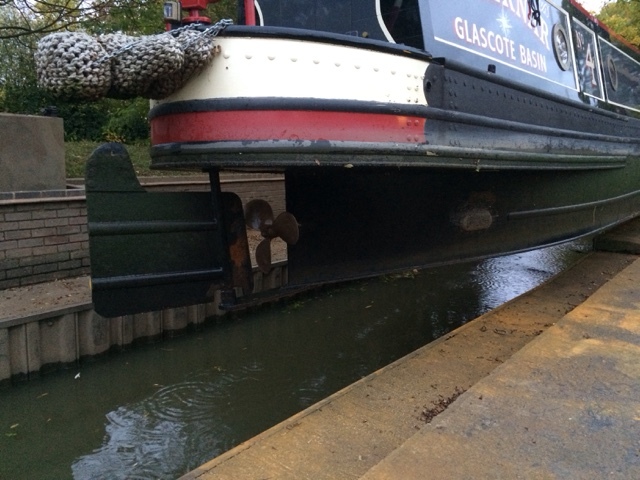 The boat was also raised far higher allowing access to the base plate. It was a little unnerving walking underneath 20 odd tons of boat, held up by just four props. We are still not sure if they have caught up with the delay caused earlier in the week, due to the hoist being out of action. 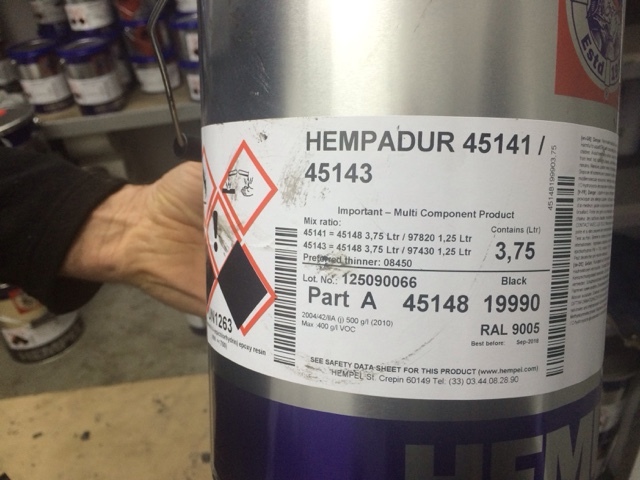 If they can finish applying the two pack epoxy blacking today, this will give it the required two days to harden over the weekend, if not the relaunch may have to be put back a day. 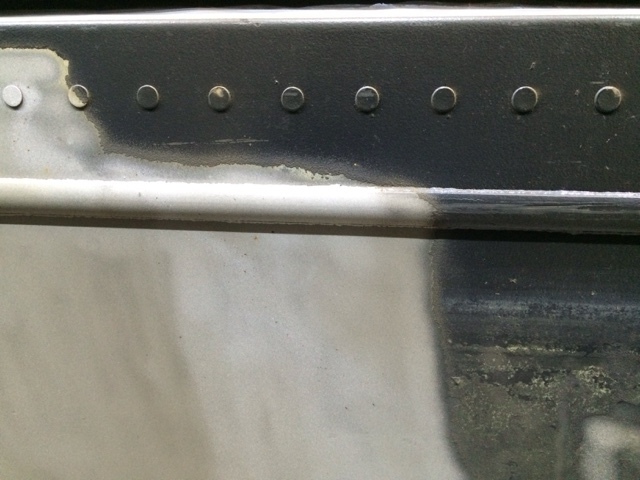 In the photos above you can see the slight difference between the bare, grit blasted hull and the newly applied zinc, with the rubbing strake being the dividing line. 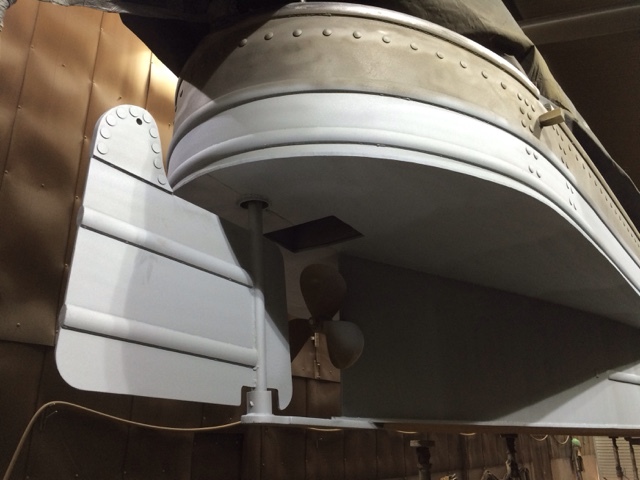 Both the weed hatch above the propeller and the bow thruster tube have been treated, and we have also had the gas locker seen too. On a visit to the boat yard today we were shown into the grit blasting shed to see the work in progress. The top sides are protected by a tent type structure, which is then firmly taped to the hull sides. 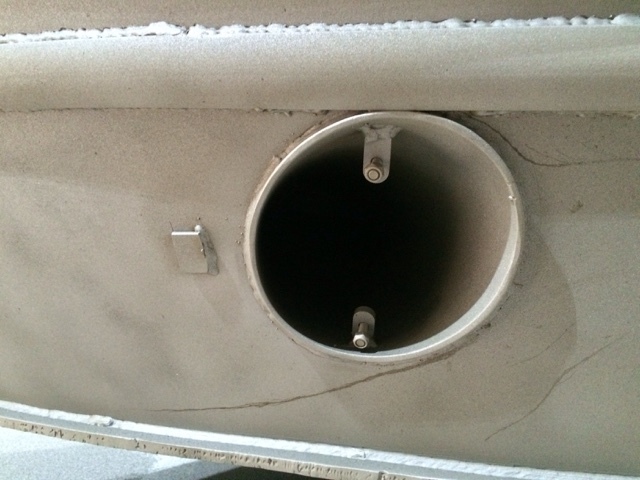 Various bits have been removed to facilitate the blasting, including the four sacrificial anodes, the bow thruster grill and the weed hatch plate. 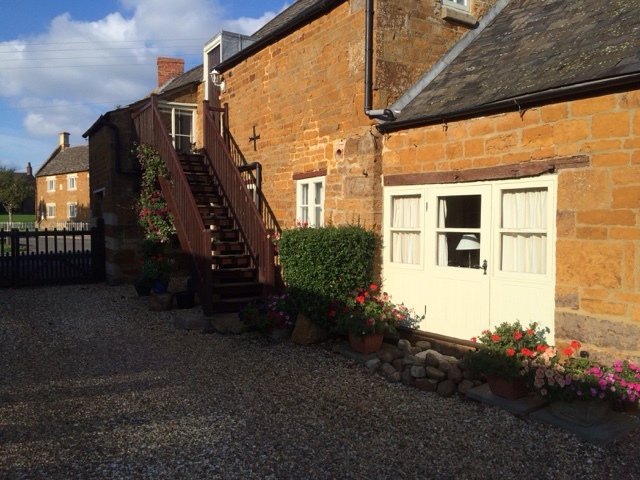 We also visited the village of Uppingham, and spent a few hours looking around the numerous antique shops. 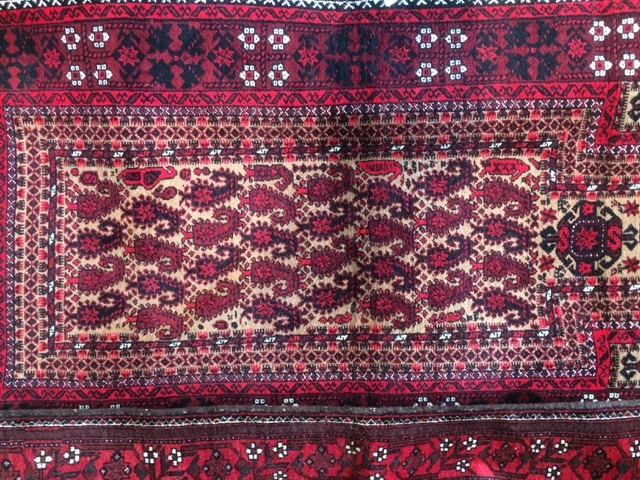 We found a shop specialising in antique rugs, and we have been on the look out for a (new) rug for the boat. 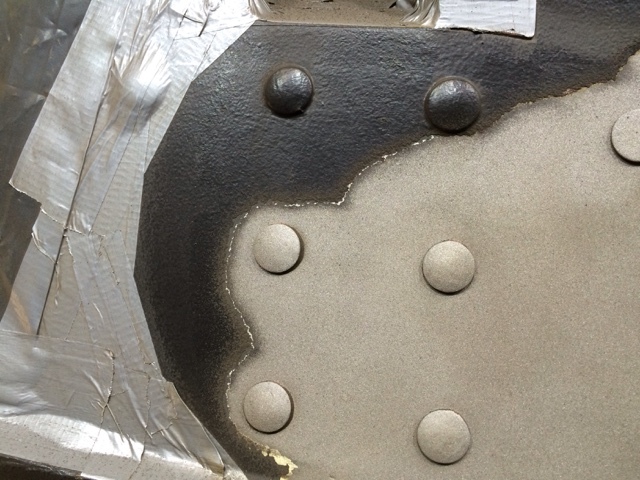 Next update will be Friday, by which time the zinc coating will have been done and the two pack resin finish, will be in the process of being applied. Yesterday we set off in the early morning gloom from our mooring at Foxton, for the short twenty minute cruise to Debdale Wharf. On arrival the service pontoon was partially blocked by another boat, so we moored between the bridge and the winding hole and went to report our arrival. The hoist used for lifting boats had been faulty last week, and although repaired, it had not been fitted back on the overhead gantry and tested. We therefore had a long wait ahead of us. To cut a long story short we occupied ourselves for the day by, conveying stuff to the cottage we have booked to stay in for the week, and going for walks. Finally, just before closing time they were ready to lift us out. The boat was manoeuvred into the service dock, and after some trial and error lifts the balance was found and out she came. 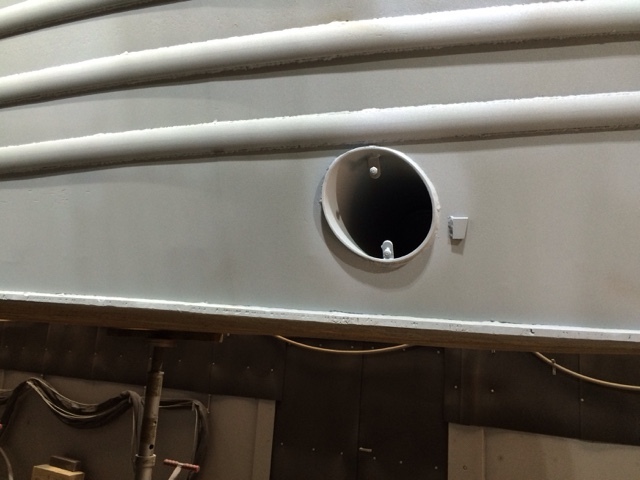 This was the first time we had seen this part of the boat, since it's very beginning in the steel shed. I was pleased how well the hull looked, with virtually no corrosion evident. After spending a night on the blocks, this morning it was time for a thorough pressure wash. Once the hull was clean it was clear to see the current blacking was still in very good condition, so once the zinc treatment has been completed we should be able to maintain the hull, in virtually as new condition. 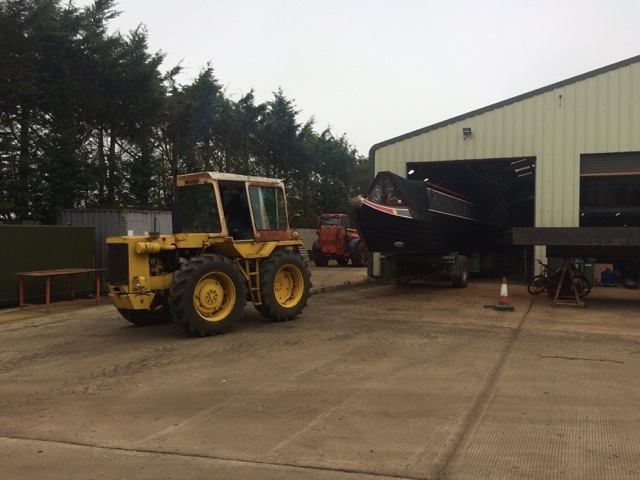 After this the boat was moved into the grit blasting shed, where the top sides are shielded by a tent structure to protect the gloss finish from the next stage of the treatment. 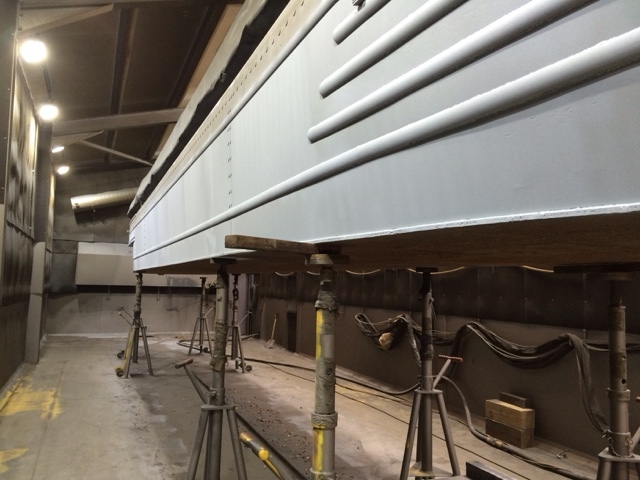 We are having the hull grit blasted from the outside edge of one gunwale, round to the other. 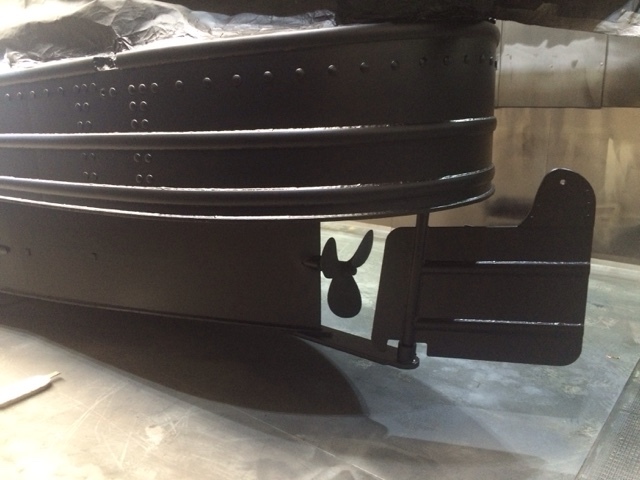 Once this is complete the hot zinc spray will be applied to the base plate and hull sides, up to the rubbing strake. The whole hull from the gunwales down will then have a two pack epoxy resin finish. More pictures of the process will follow as it progresses during the week. Clearly whilst this work is being carried out we have had to move off the boat. 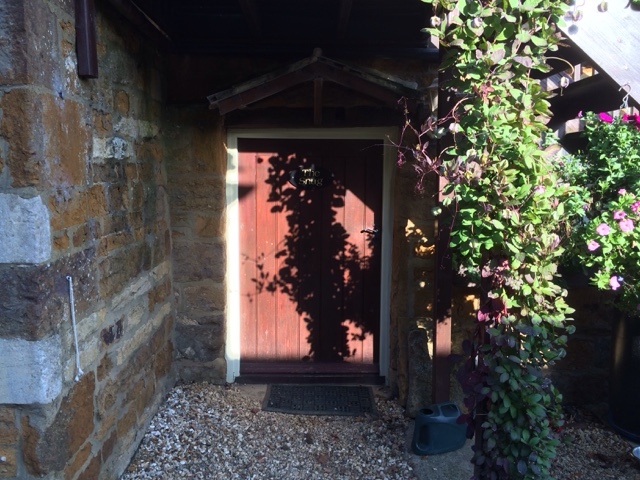 We have booked a cottage for the week in Caldecott near Rutland. This cottage is called 'The Snug' and it is. 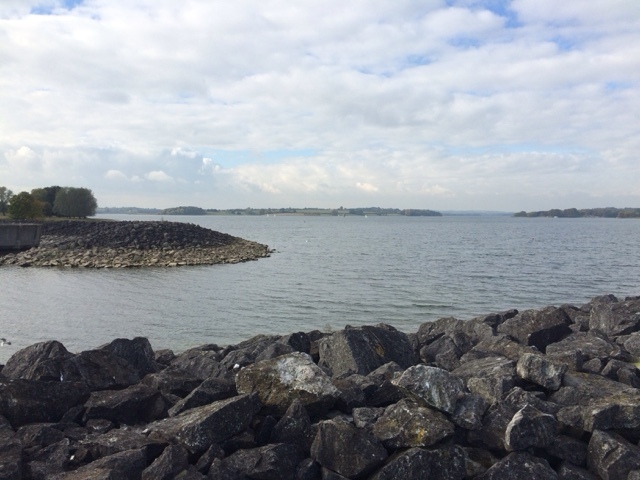 Today we took a trip to Rutland Water for a walk. The weather was warm and sunny and it is reported to be the best day this week, so an opportunity not to be missed. There were plenty of dinghies sailing on the water and also the odd yacht. 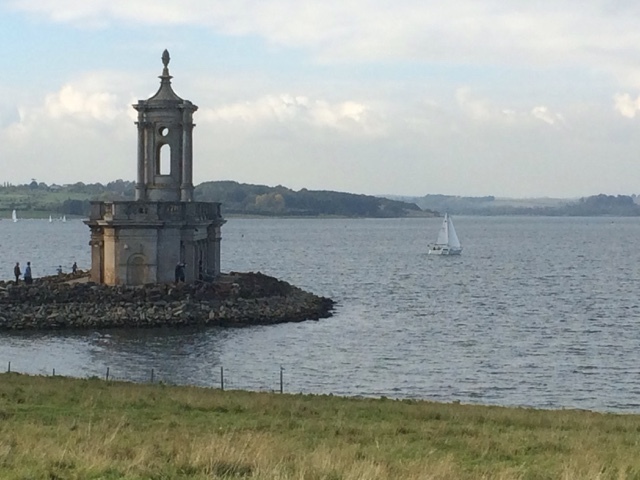 It reminded me of where I learnt to sail on Bewl Water in Kent, but this appears larger. After the walk we found a nice pub, 'The Wheatsheaf' in the village of Edith Weston. The boozy steak pie was the best I have ever had, and they do Sunday roasts so we are booked in. They are very dog friendly so we will let Oscar come too. 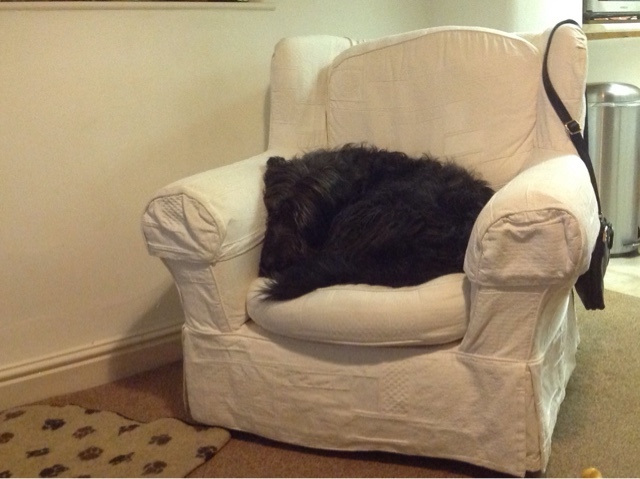 Once back to 'The Snug' Oscar, being used to home comforts on the boat, selected his spot in one of only two available armchairs. Unfortunately for him, this belonged to the two legged crew so he didn't keep his spot for very long. 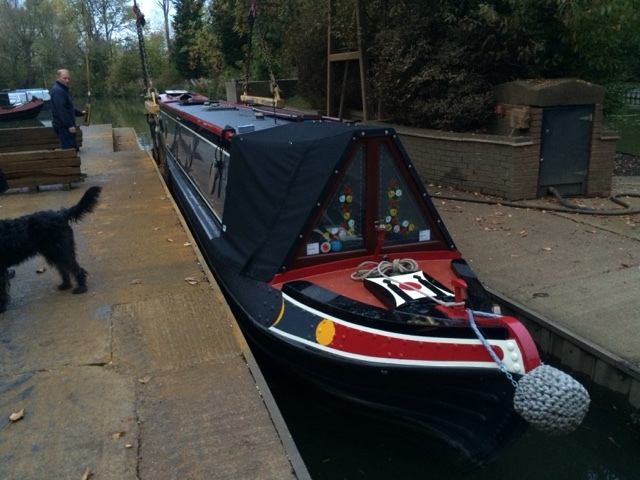 Well we have now been at Foxton for a week, awaiting our appointment at Debdale Wharf Marina. We departed Welford on Friday 9/10 in warm autumn weather. We turned left at the junction, and were soon passing North Kilworth. The new Marina that was being dug the last time we passed, still looks as if it has a long way to go before being finished. Husband Bosworth tunnel was next, at a relatively short 1166 yards. It was then a peaceful hour cruise to our destination near to Laughton Hills, a mile and a half from Foxton top lock. 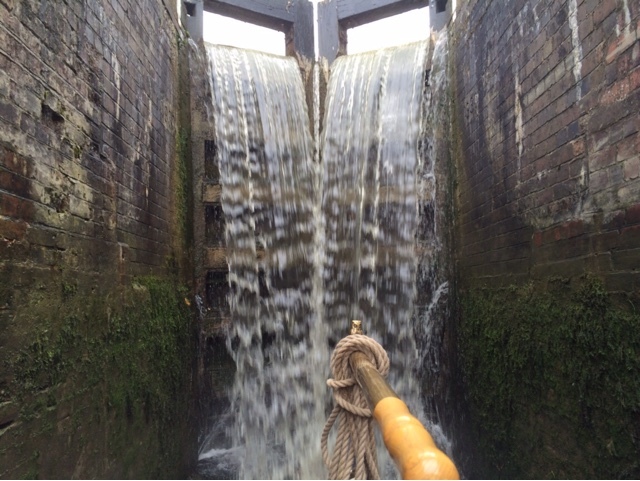 Saturday 10/10 we descended the Foxton Locks, which are made up of two staircases of five locks each. Being a weekend and fine weather, we had set off early to be down the flight before all the gongoozerlers turned up. Unfortunately our plan was foiled. We had an hour wait at the top whilst four boats came up the flight first. Consequently we were watched, and photographed all the way down. I also found it prudent to keep the boat close to the bottom gates going down due to water flooding over the top gates. Once through the flight we found our mooring spot by a reed bed just outside the the heavily restricted Foxton mooring zone. We can stay here for a maximum 14 days whilst we wait for our booking at Debdale. Thursday 15/10 we needed to run the boat to the marina for a pump out and then back to our spot via the water points at the foot of the locks. During our stay here, two Sunday's have passed meaning two visits to the Foxton Locks Inn for a roast dinner. The three of us have become regulars there, and today Oscar was even treated to his own trimmings from the beef joint, courtesy of the landlady. This pub is very dog friendly. 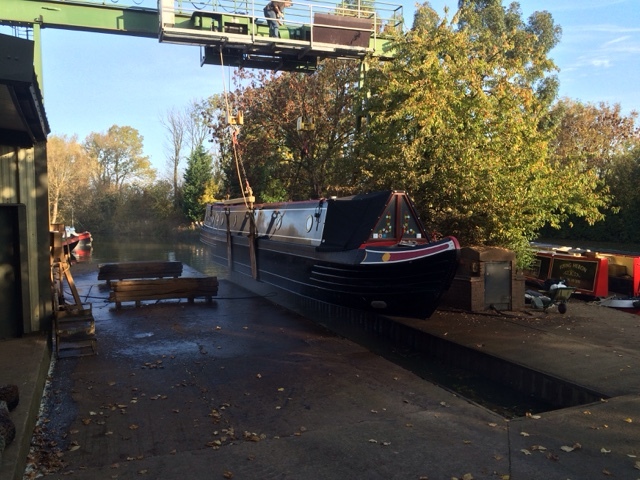 Tomorrow we will get to Debdale Wharf for about 8am, ready for the boat to be lifted out for its zinc treatment. Having spent three days in the marina reacquainting ourselves with neighbours and friends, it was time to set off again. We slipped away from our berth in warm autumn sunshine and turned right from the marina onto the cut. We had decided to aim for Foxton by Sunday, as the Foxton Locks Inn serves an excellent carvery. An hour and a half into our journey we arrived at a favoured mooring near bridge 28. During last winter, the Canal and River Trust were conducting dredging operations in the area, and they used the fields here to spread the dredged mud. It looked like a bomb site whilst they were doing it, but now, 8 months later the area has recovered and it is once again a picturesque spot. We pulled in for a brief lunch stop and allowed Oscar to stretch his legs. Although tempted to stay put, after lunch we set off again now aiming for Welford Junction. As we rounded the bend towards the straight section of moorings, we saw that there we already a few boats in situ. Preferring some solitude we reversed back aided by the use of the bow thruster to a spot we had just passed that looked promising. We will only be staying here one night but this may become our preferred spot when visiting Welford Junction in future. Today we departed Norton Junction heading for Yelvertoft. We had a brief window between two weather fronts trying to avoid the rain. We set off at 0715 hrs passing within 30 yards of Watford Gap services on the M1, and arriving at the base of the Watford Staircase Locks just after 8. The crew checked in with the lockie and we were the first in line. We had a brief wait whilst some water was run down the flight to fill the low pounds. Usually this flight has restricted opening hours but for a trial period the locks have been left fully usable 24 hours a day. The problem is people using them are allowing the flight to drain overnight so this trial period may not last long if the problem persists. Once through the locks it was a short hop to the 1528 yard Crick Tunnel. As usual the northern end was dripping wet. 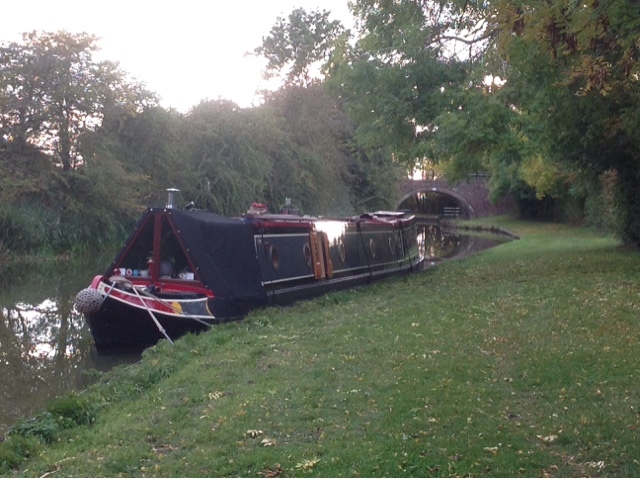 We passed Crick Marina, then rounded Crack Hill. Navigating the final bend towards Yelvertoft Marina we had our first glimpse of the new slipway and wind turbine. We nipped into the marina for services and have decided to stay a couple of days as the weather is forecast to be bad. We now have the luxury of plug in electric and an unlimited water supply. We are booked to stay until Thursday when we plan to set off again towards Debdale. This morning we departed our spot at 0815 hrs, and three quarters of an hour later we arrived at the water point in Braunston, by the Gongoozerlers Rest ( a cafe boat ). We filled with water and dumped some rubbish, before obtaining a couple of slices of toast and marmalade whilst waiting. We were soon joined on the water point by Nb Inca, whose blog can be found in our blog list. They were going the same way, so we now had a locking partner for the six wide locks we had to do today. We had seen Inca before on the Shroppie, but this was the first time for a chat. 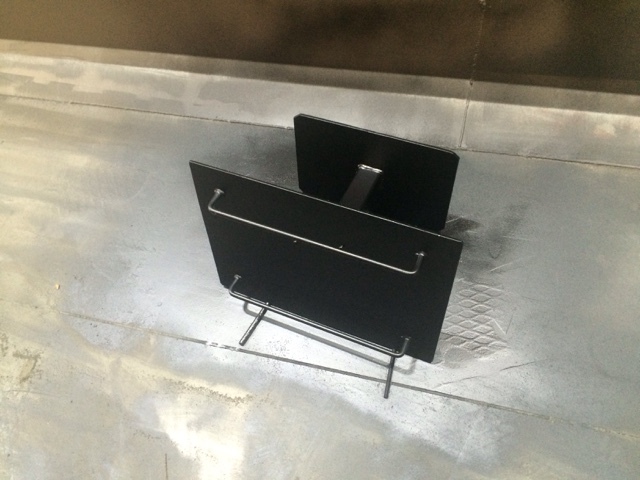 I was pleased to hear they are happy with the zinc coating they had done, as we are on our way to Debdale for the same process. Once through the locks, we were soon in the 2042 yard long Braunston tunnel. We met two oncoming boats, but passed both without contact. Back into the daylight it was a mile and a half to Norton Junction where we said farewell to Inca, we turned left onto the Leicester Line of the Grand Union Canal. We found our usual spot vacant, so quickly secured the boat before nipping down to the New Inn to book our Sunday roast. It was lunchtime so we enjoyed their hospitality. Now back on our winter waters, we plan to stay here till Monday, when we will set off up the Watford staircase locks aiming for Yelvertoft.